This collection of six recorded puppet scripts range from three to seven minutes in length, and uses two to six characters. Two plays need animal characters and the other four are written for people puppets. 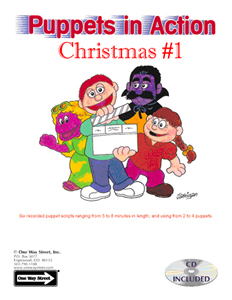 These scripts use humor and imagination to retell the Christmas story. Pre-recorded skits on CD, with printed scripts included. These Christmas scripts will enhance your holiday performances.